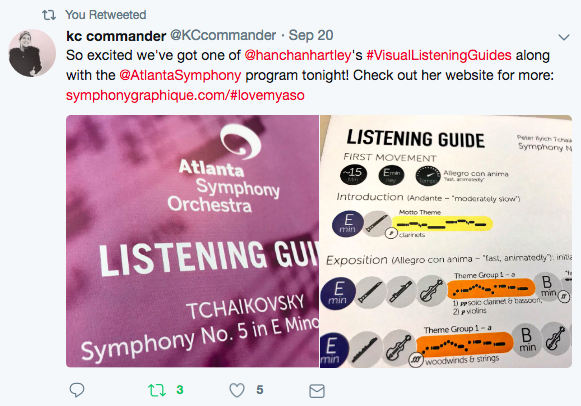 For their opening season concerts conducted by Robert Spano, Atlanta Symphony Orchestra created a beautiful brochure insert featuring my Visual Listening Guide to Tchaikovsky’s Symphony No. 5. Mark Gresham, who reviewed the program for Arts Atlanta, noted that “there were a couple of young adults seated next to me who were actively using the guide during the work, and perhaps that is the demographic to whom the symbol-filled graphic guide is addressed.” Although the Guides are intended for people of varying experiences with classical music, I love to hear that young people find them a useful way to engage with a symphony during performance.